The final report of the Duffield opening year. It was a mild day with some rain and some sunshine with a few volunteers on site. The DMU Group split into two. One half worked on preparing the service train for the New Year Trains and Fizz event tomorrow, with particular attention being paid to 51360. The other half continued where they left off yesterday in the class 119. The passenger department also prepared for the event tomorrow primarily making sure there was enough Fizz in the Bucks. The Pullman painter attended this morning with a view to varnishing the No.1 side but found that the weather conditions were against him with it being cold yesterday and mild today. When this happens, a 'sweat' occurs and the body side panels become damp which in turn means that painting cannot take place. On the way out all of the gates were manhandled into place to close 2011.
be where bees and other such wild and ferocious creatures will be kept. so that Rodney can finish painting the Mess Room when the weather improves. service of seasonal refreshments to passengers. Horrendous weather conditions in the valley today with driving torrential rain and gale force winds. Indeed, the LMSCA platform gazebo took the worst of it, with parts being flung across the platform and track! A small amount of volunteers still managed to move our enterprise forward. A small but armed P-Way gang headed for Shottle where they cleared an area to make way for the loop line. In the engineerium, a first coat of cream was applied to the No.1 side of the buffet. Rumour has it that the vehicle may be "finished" by next week if all goes according to plan and the vehicle will emerge as the Pullman Buffet! Next door work continued on the bubble car bodywork with an area around the guards door receiving a full days attention. The Booking Hall prepared for Sundays New Year Trains and Fizz event. A report tinged with a little creativity as I have man flu and retired hurt in the late morning relying on the restorative powers of Scottish products to keep me going. However, I am grateful for the team of Patrick, John Evans and Richard Buckby to tend to our charter train customers and it is gratifying that we picked up a few extra passengers to swell the coffers. John Saville looked after the Booking Hall and ensured Wirksworth station was open for business. 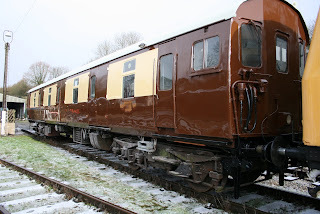 The Bubble Car and Buffet Car received further attention and this week should see the finalisation of the Buffet Car's exterior renovation. A small dmu team continued their restoration work and it was good to see a flying visit from Phil Tarry who took the opportunity of a whole line tour. Today saw a lone Permanent Way Team member as no one responded to his offer of post indulgence work outs. A gentle reminder that site security over the remaining days of the holiday period requires vigilance and all gates to be locked. Visits to all parts of our empire are encouraged as part of the deterrent to any unwanted guests. 'Tis the season of stealing! Our Santa Train season was brought to end today with another most well received visit to the North Pole. Everyone involved should take a bow as all the planning, present gathering and on train staffing has seen the best financial result in our short history. At Wirksworth there has been a little other activity by the 8F Group and dmu car W51073 has had some serious work towards its restoration. I would ask those of you who live near any part of our Railway to try and take a look over the next few days to ensure that any unwelcome visitors are detected. Over our nine miles we are quite vulnerable in these peculiar times but between us we can provide a deterrent. I wish everyone a most pleasant Christmas and time to recharge the batteries for renewed effort next week. An amazingly productive day given its proximity to Christmas with the PWT enhancing the harvest of redundant assets at Shottle for sale in the New Year that will aid us to achieve the projects we have set ourselves when there is little alternative income. Saturday's final Santa train has been serviced including a check on the heaters that are all now working efficiently. With some difficulty LJB has been shunted to the pit road and work has commenced to strip down the area of the defective water pump. As ever, this is proving a complex task which seems to involve the oil pump, alternator and errant water pump. LJB seems to have not designed ease of maintenance when he put the locomotive together! After a false start yesterday due to weather conditions John was able to apply the umber undercoat to the Buffet Car's east side today and, conditions permitting, will apply the gloss tomorrow. All being well, the interior fitout can commence in January presenting quite a challenge to John Birkinshaw. The Bubble Car is also coming on in leaps and bounds with the floor in the Guards compartment receiving attention today. The VCT tended to an area north of DJW6 before retiring to the luxury of The Railway Hotel at Shottle for their Christmas Lunch. This unique team has achieved tremendous work and well deserved their annual celebration with a full turnout of 10 members. They really do ensure our passengers have delightful views of the Valley and that the sightlines at our many accommodation and footpath crossings minimise the risks of incidents. Their continued efforts to repair some 18 miles of fencing using the minimum of bought in materials does not go unnoticed. A delightful team that just gets on with it! The Booking Hall dealt with the remaining Santa bookings for this Saturday and there is a gentle take up of advance sales of our Day Rover as a stocking filler for Christmas. Many of you will know that today is Hanukkah and we have celebrated this day with a variety of activities that included the visit of Moonki Cho and Nanda Marri who are both studying for their masters degrees at Birmingham University's Railway Engineering department. When quizzed about the Christmas period, which you would think makes little sense to them, they and their fellow students from around the world including Indonesia and China had prepared a Christmas meal at the University featuring the cuisine from their native lands. I find it most encouraging we are part of this world of railways and we hope that our two people today will come up with a solution that enables us to pass trains at Shottle within a budget we can afford. At home we have a Hanukkah bush that closely resembles a Christmas tree. The PWT set sail for Shottle with their Tool Van attached to the rear of a two car dmu following the failure of LJB and this is now safely berthed at Shottle having had its security beefed up and any valuable tools transported away from the vehicle. The team achieved a further three cuts in the former long welded section and accumulated some 3 tonnes of scrap for fundraising. The Buffet Car received more attention to the doors on the east side that enables them to be opened for ventilation in warm weather, if you can remember that, but further painting was defeated by today's weather conditions. Another attempt will be made tomorrow. The bodywork repairs continue on the "Bubble Car" and an accommodation has be reached between the tow restorers. The lone carriage cleaner was at work on the Santa train to ready it for its final task this Saturday and the son of the lone carriage cleaner has completed the repainting of the Mess Hall except for the skirting board and floor. The count down to Christmas has commenced with the DST announcing that they will be in evidence next Wednesday rather than their normal Tuesday. Steam obviously needs more recovery time after the season's excesses but, nonetheless, they have achieved a few moments today with a frustrating hydraulic test of No3 requiring more work and further attention to Kathryn. The VCT achieved a magnificent four fires in the Barnsley Lane area and managed the shipping of debris from 40 Steps to the burning area. They were assisted by Mike the Flail to move some of the heavier material before he tackled the area north of Idridgehay. The last day of activity on the long running S&T van saga saw the fitting of "domestic comforts". The mind boggles. The LMSCA organised the disposal of waste products from the fire and the Booking Hall gathered the accounting necessary from the past seven days. The PWT transposed five rails on the former Gorsey Bank line releasing good rail for the planned Shottle loop. We had the first meeting of the Duffield Toilet Team (DTT) which crystallised the options to us there. I always find it interesting that the areas of thought necessary to running our Railway seem to involve anything other than running trains. Dorothy marked the Christmas period with a magnificent green Christmas Tree cake and sundry supporting cup cakes. All most appreciatively received and not a crumb left. 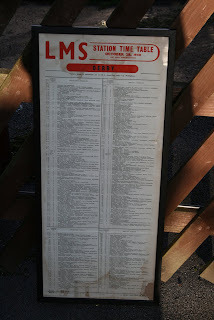 PS - To follow up the October 1940 Derby departure and arrival sheet I can report the donor was Peter Stowell. With an heritage on the railways until 1968 he commenced his travels to Australia, South Africa and Australia again. He is now volunteer resident Station Master/Signalman at Menzies Creek and drives steam occasionally on the Maldon and Castlemain Railways in Victoria and South Australia. The travels of this artefact are now assessed at a staggering 30,000 miles. attending, and this is right and proper. could be found for miles around. which all exhibit, and of which we are tremendously proud. excessive falsehood, in the morning. Apart from a flurry in the afternoon, the promised snowfall didn't materialise which meant that round 3 of the Santa Specials could go without hitch. Most of the activity around the railway centres around this. Many thanks to all who helped out with this. Down the yard, 55006 saw much attention to the bodywork areas that have gone rusty over the years. This meant stripping out some interior panelling in the guards van. Members from the 8F group and the LMSCA were also in attendance. We are pleased to announce that the stock list has had a total revamp. The PDF version had become very large and very cumbersome as the railway has grown and so we thought it was time to come into this decade! The PDF version has been replaced by a much easier to maintain Online Rolling Stock Guide which can be found under the Enthusiasts section of the website (or at http://www.e-v-r.com/stock/). All of the previous information is on there and we hope to add more images and information over time to build it up. John Stokes remains the contact for maintaining the information. We hope you like it, we certainly do! Great progress with the Buffet Car with much remedial body work achieved to the east side which has turned out to be the worst aspect of this vehicle. The application of small steel sheets, much filler and sanding down has pulled the vehicle round. Attention has been paid to the security of the Tool Van so that it can be left at Shottle without being denuded of its contents. Many thanks to Anton and Eric who hosted a visitor from East Midlands Trains in the form of Wayne Kyte, their Leicestershire Route Manager.The more product knowledge EMT have the better! 51505 had attention to it's interior cab and the Booking Hall received quantities of refreshments for the upcoming weekend's Santa trains. Some of our key people have been struck down by severe colds and any help that can be given, particularly on Sunday, would be most welcome. One step forward and one step back I'm afraid as the problems on LJB prove to be more serious than thought. It would seem that the water pump has failed and this is a large lump of equipment underneath the locomotive. The next step is to remove the pump and see whether it can be refurbished or replaced. We therefore have no shunting loco available and will have to tailor are next few weeks around this circumstance. On the up side the VCT continued their work and the PWT completed the repairs to part of the aged pointwork at the north end of Wirksworth Yard. The dmu team concentrated on keeping the Santa train up to scratch with particular attention to the heating essential to this enterprise. OB Design are holding their Christmas party in the Royal Saloon as I write this and they should be credited with the production of the iconic poster displayed at East Midlands Trains stations this year and have said that new version may emerge from today's fumes to excite us in 2012. In a spirit of co-operation the Station Garage is being provided with access to our internet facilities with thanks to Chris Ralls. We hope that this will benefit their activities which, in turn, will ensure our modest rental demands will be paid. Again, much activity in the Maintenance Facility on both the Buffet and Bubble Cars with a feeling that there is now a modest competitive energy. The two experts involved are jousting which seem to involve John's hand being pop riveted to slow him down. PS - Maurice Jordan has facilitated the acquisition of a most interesting artefact comprising a Derby arrivals and departure sheet published with effect from 28th October 1940. He and his wife have funded it's framing and preparation for display in the Museum coach. The donor, whose name I will publish next week, was a former Derby railway employee who spotted the sheet in a skip in the 1960s. He then took the £10 package to emigrate to Australia, only to return to the UK after his then wife could not settle, left the UK for a period in South Africa, returned to the UK and emigrated yet again to Australia. He is now a Station Master on the Puffing Billy Railway. This arrival and departure sheet has accompanied him on all these journeys so has travelled 20 to 25 thousand miles. Through his friendship with Maurice he has donated it for our collection. The sheet shows departures to Wirkswoth at 6.55am from Platform 2 for "most" stations to Wirksworth, 12.45pm Platform 1 Saturdays Only All stations to Wirksworth, 5.l7pm All stations to Wirksworth (except Nottingham Road on Saturdays) and 7.58pm Platform 2 Saturdays Only for All stations to Wirksworth except Nottingham Road. The arrivals side show 8.30am Platform 4 All stations from Wirksworth, 2.34pm Platform 6 Saturdays Only All stations from Wirksworth, 6.38pm Platform 6 All stations from Wirksworth and 9.14pm Platform 6 Saturdays Only All stations from Wirksworth. Wonderful stuff! A bitterly cold day warmed by a flurry of Santa bookings ably handled by Leigh in the Booking Hall. It is interesting that nearly two thirds of these bookings are on line and it is a credit to Leigh and Robin that this is now possible. My thoughts turn to how we might increase the product range accessible in this way. The PWT had achieved their track patrol partially yesterday and completed the task today. Another unsung but vital endeavour that ensures the safe operation of our trains. With LJB disgracing itself yesterday the remainder of the team tackled much needed remedial work to the north end of Wirksworth Yard as these assets are showing their great age. In the Maintenance Facility great progress was made on both the Bubble Car and the Buffet Car. This first undercover area for our Railway is really proving its worth allowing work to continue in the worst of our weather. I interviewed a student from Derby University who will work with us for three months as a result of JHT's presence at the student fair in the Roundhouse a couple of months ago. She will provide a little youth to the Booking Hall on Saturdays from late January to late March and I am sure will be made most welcome. The lone Carriage Cleaner gave the Santa Train a good do and ensured the Mess Hall is hygienic for a few days. Firstly I must heap praise on everyone who delivered the first weekend of our Santa trains. They were extremely well received and have attracted many expressions of praise. Well done everyone! Today saw a return to the more mundane but equally necessary to our future. The VCT concentrated on an area around milepost 136 1/4 on the Up (east) side creating more large fires and vistas that our passengers will enjoy. The PWT also ventured into the area between Shottle and Duffield clearing off the remaining sleeper changing in this section. LJB disgraced himself again with a failed water pump seal resulting in the rest of the week for the PWT being spent in Wirksworth. The DST prepared No3 for hydraulic boiler testing, made further progress with Henry Ellison's lubrication and released more parts to allow Kathryn's boiler to be examined. The S&T van revealed its new LED lighting system whilst the team enhanced its storage capabilities. The pot bellied stove gently provided warmth of the S&T team and I have run out of descriptive for a basic four wheeled van! The Bubble Car, M55006, is coming along nicely with a great deal of the rotten areas of body being dealt with and it would seem that, with the aid of the Young Offenders Team, we can move on some of our waste oil to a better place. The Booking Hall wrapped up the final financial contribution of the first Santa weekend and began ordering the commodities for the next adventure. heard on the radio when it was turned off. A freezing cold day with lots of ice around this morning saw day one of our Santa Special days. There were many happy people seeing Santa in his new on board grotto. Santa has gone home for a short rest before another load of presents are delivered by Express Polecels in the morning for tomorrow's passengers. 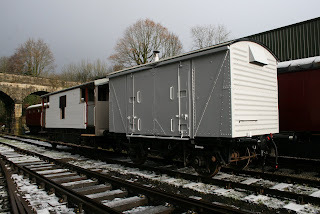 Down the yard, the 8F group were in attendance and work progressed on the LMS Brake Van. The DMU team worked on the cab desk in 51505 and bodyside repairs continued on 55006. You may have noticed that I ascribed the 9th to yesterday's report and I have now aligned the temporal vortex such that today's date is correct. Most of the energy has been applied to Santa Train preparation with more attention to the North Pole destination and continued work to ensure Duffield enters into the Christmas spirit. Supplies of the commodities to entertain our passengers were sourced by Angela and delivered to the train today. To get ahead of the game the Santa Train was fuelled and berthed ready for departure tomorrow. Tremendous effort falling on the few that concentrates minds on what we might achieve in 2012. The Pullman Buffet Car saw the roof painting completed and the final application of black gloss on the west side to the bogies. For those of you attending the Railway over the next three weekends please remember that the Santa Trains are the first priority no matter which department you work in and I echo Anton's comments that orange must not be seen other than "on track" essential work. Another most unpleasant day with high winds and sharp downfalls of rain. Nonetheless, the strong character of the few kept the show on the road. The PWT multitasked by taking Duffield Christmas tree to site, managed to change a further 4 sleepers between Shottle and Duffield and return to base with a half load of logs. As there were only three of them this was quite an achievement. The VCT battled on with clearance near Barnsley Lane with the aid of one large fire that also consumed the redundant timber from the old raised platform at Idridgehay. Again, they were working in the worst of conditions and deserve special praise for this. At base the Santa train received a great deal of attention to ensure it will work faultlessly during its starring role and it now boasts six working heaters which will be much appreciated by our guests. Deep in the Maintenance Facility the Buffet Car had the east side of the roof undercoated, bogies painted and preparation for repairs to the lower body. On the adjacent track the Bubble Car had many repairs to its bodywork that is beginning to restore the vehicle to its former self. I also need to mention the continued good efforts of the Filing Fairy last Tuesday reflecting great credit on Dawn who is not enjoying the best of health and, during my absence yesterday, the lone Carriage Cleaner gave my office a good do finding things that I had long forgotten! It all goes to show that there remain many unsung heroes amongst us that, collectively, make the whole enterprise work. A raw day with many heavy showers, some with snow and hail, and a strong biting wind. Today mainly involved preparation for the forthcoming Santa weekends. Several stations received more decorations and the Santa train itself saw a good clean, from the Lone Carriage Cleaner who for once was not lone - being joined by the odd member who would normally be doing permanent way work. The Booking Hall continued to process a good number of "late" bookings. Please note that tomorrow afternoon is the last time you can book for Santa trains this weekend. This is because it takes a long time for a booking to get to Lapland and the elves have to have time to prepare the presents before Santa departs for Derbyshire late Friday night in time for Saturdays specials! In the engineerium, preparation work was done on the other side of the Pullman Buffet Car roof ready for it to receive some paint tomorrow. The bubblecar's body side repair work progressed as well, with sections at the bottom being attended to first. Contractors Amey spent the morning concluding their work on the bridges of the Valley for the time being. A grim cold and wet start to the day caused the VCT to stop work after an hour or so and I thought I would have to report they achieved nothing at all for the first time in eleven years. However, some brave souls returned to their duty and continued to cleanse the Barnsley Lane area reporting one large fire that has certainly saved their reputation. Mike the Flail also visited Barnsley Lane to move a very large tree root and then went on to flail the area between Willow Crossing and Shottle to produce a sculptured hedgeline there. The bridge inspections entered their penultimate day dealing with Barnsley Lane and Jebbs Lane together with a number of other locations accessed by van. My thanks go out again to Tom Tait who has hosted this vital activity. The PWT deserve a special mention today as they achieved an heroic performance with just four of them. They emptied the Lowmac of "smalls", recovered "garden" quality sleepers from the former Gorsey Bank line and unloaded them to the stack in the Car Park. They then returned to load some 80 reusable sleepers onto the Sturgeon, which is quite a height from ground level, and deliver them back to Wirksworth. All this was hard manual work which would have reduced lesser men to jelly. The DST investigated and started to remedy a fault with No3's regulator, continued piping up the lubricator of Henry Ellison and made progress in preparing Cathryn's boiler for lifting. The LMSCA continued the sad task of stripping out the Third Open and progress was made at Idridgehay that will allow a power supply to Santa trains whilst berthed there. The S&T van, gleaming in the watery sunshine during the mid-morning, had its stove christened and white smoke rose above the vehicle (Just like the Vatican). The underframe was pressure washed and looks as built but the interior lighting, flat screen TV etc. was set back by the incorrect parts being ordered. A further attempt will be made at these essential accoutrements as the week progresses. The Booking Hall dealt with the quickening pace of Santa enquiries as well as achieving further decoration of the Santa train. PS - there will be no PW activity tomorrow so if you can reschedule to Thursday it will be most helpful. Anyone who can help with station and train decorations tomorrow and Thursday will be made most welcome! Quite a shock to wake up to snow this morning but this didn't dampen the spirits of Amey who fielded a very large team to continue the examination of our over bridges. Their road/rail vehicle was again ably hosted by Tom Tait and the day shortened as they gradually move closer to Wirksworth. Mike and Graham came in specially to perform specific shunting that transferred the Buffet Car from one side of the Maintenance Facility to the other so that the east side can receive attention and move M55006, the Bubble Car into its place for much needed bodywork repairs. The S&T van and Tim Oaks LMS brakevan have been removed into the fresh air with the first vehicle now being complete after a major makeover and the latter in a water tight condition. We emulate the Pullman Car Works at Preston Park setting new high standards of course! The Booking Hall dealt with a range of enquiries including the relocation of a pigeon loft and LJB had the antifreeze treatment. Again all these activities took place in most inclement weather testing anyone's resolve in their hobby. A couple of photos support another great leap forward. PS John Snell attended a meeting of DVLCRP on our behalf which should result in a leaflet highlighting the two heritage railways served, an invitation to provide material for another display at St Pancras International and a review of the disabled access at Duffield (main line). presents which is taking place even as most of you read this report. must be approved by the General Manager on Santa operating days. A very chilly day in Wirksworth which saw the last of our Winter Timetable days for a while. Santa next week! The passenger department spent the whole day decorating the North Pole Express for next week. The red bulbs in the grotto really finish it off! Down the yard, the LMSCA were in attendance and work continued on the LMS brake van. The DMU team rekindled memories of a few years ago as the Class 119 was rolled on to the pit for the restoration to commence. This vehicle was last touched 23 months ago, but last ran in 1993! Another departure today as we rationalise our rolling stock. Santa's former accommodation, a BR standard brakevan, has left us to go to the Ribble Railway at Preston as he can now luxuriate in the warmth of a diesel multiple unit. Dmu maintenance continued with 51505 being prepared for receipt of its new first class carpet tomorrow. I am sure the end product will be wonderful. The Buffet Car has been varnished on the west side and front end ready for is movement on Monday so that work can start on the east side. The preparation work is quite involved as there are great areas of rust and deterioration to be dealt with before any paint is applied. Anton visited Idridgehay with an ingenious pair of platform lights powered via a solar panel and battery as part of the preparations for the immanent Santa season. Christmas trees were delivered to Wirksworth that will grace both Wirksworth and Duffield. Today saw the conclusion of four exercises conducted for East Midlands Trains. These have not been broadcast via this medium before as the participants should not be aware of the plot beforehand! Basically East Midlands Trains have invested in training courses for their staff on how to deal with an emergency and how their customers will feel about the information or lack of it. The scenario was that the train had stopped suddenly and passengers needed to be detrained. The "incident" took place at Hazelwood each time and there was a degree of play acting to simulate the reaction of passengers and train crew. The EMT team were fulsome in their praise for our participation and today's activities were overlooked by Rail magazine. My thanks go out to our Railway train crews that participated each time and that no information leaked before the concluding event today. I am very pleased that these activities continue to cement relations with EMT. At base the Buffet Car has had the top coat of Fing Umber Orient on the west side and, weather permitting, this will be varnished tomorrow. You will gasp in amazement when you see this vehicle. The PWT, who have had a strange week, released Pan 11 chairs from sleepers on the former Gorsey Bank line and loaded then to the Sturgeon during the morning. In view of the EMT activities they were confined to Wirksworth Yard this afternoon and provided some most useful shunting of stock including the preparation of the Works Train for next week. The Shark, a ballast plough fitted brakevan, departed for the Foxfield Railway after being declared surplus to our activities as the Komatsu can accomplish its work much more effectively. The VCT had a road borne day due to the EMT requirements but cleansed an area around Barnsley Lane with one very large fire reported. I am most encouraged that the additional Christmas Eve Santa train gained its first 6 participants today and the Booking Hall uploaded web revisions to reflect the planned timetable and events for 2012. A look at the catering page, also revised, will see the Pullman brand coming to the fore. All great stuff!